When people talk about their bucket lists, generally where they want to see or go. I think to myself what would be on mine?! As I have said previously I am lucky to have been so well travelled thus far and have experienced many adventures and witnessed amazing sights. This got me to thinking, I now have a small bucket list and this beautiful place I am about to tell you all about is definitely one for yours! I can’t quite remember when I came across a picture of The Rock a few years ago, not realising where it was or how I could get there. 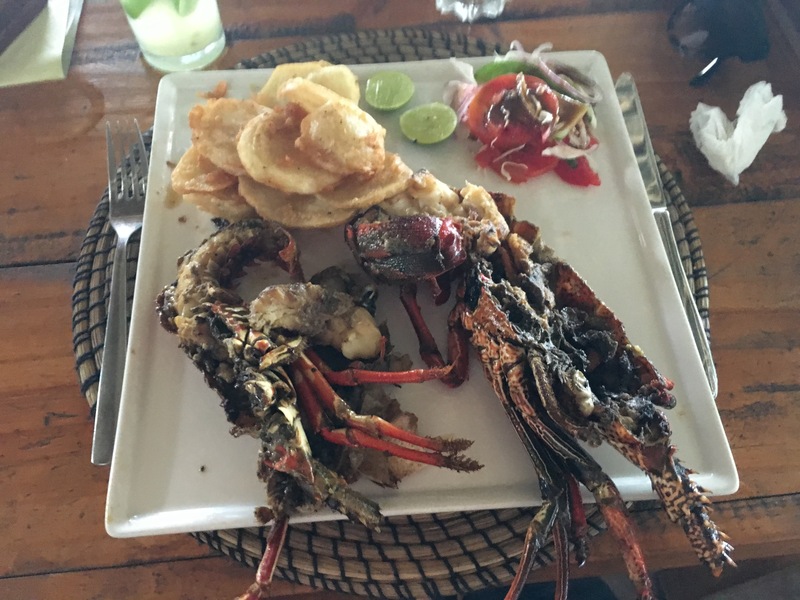 It stood out as a place I needed to see with my own eyes, then when I came to plan my trip to Zanzibar I knew what had to be at the very TOP of the list of what I wanted to see… Shortly after my flights and hotel were confirmed I was online reserving a table for lunch at The Rock, that was last October! Fast forward 8 months and I was sitting on The Rock’s back terrace with a Caipirinha in my hand, realisation that my dream had come true. It was everything I had thought and wanted it to be as an experience. Now sitting here writing about it a few weeks later, it feels like a distant memory. The Rock of Zanzibar, it’s location is a small distance from the shore of Michanwi Pingwe beach, in Pingwe. This is on the southeastern coastline of Zanzibar island, which is a 10 minute drive from Paje and 45 minutes from Stone Town. It was a two hour drive from Nungwi on the north coast where I was staying, if you contact The Rock for your reservation by email or on their site, they will arrange a driver to pick you up from your accommodation and return you afterwards for a fee. The journey seemed to go quickly and once we arrived on Michanwi Pingwe beach just before lunch time, I could see The Rock and my excitement levels peaked beyond imagination. Due to the tide being in, I had to take a small boat over which took less than 5 minutes. 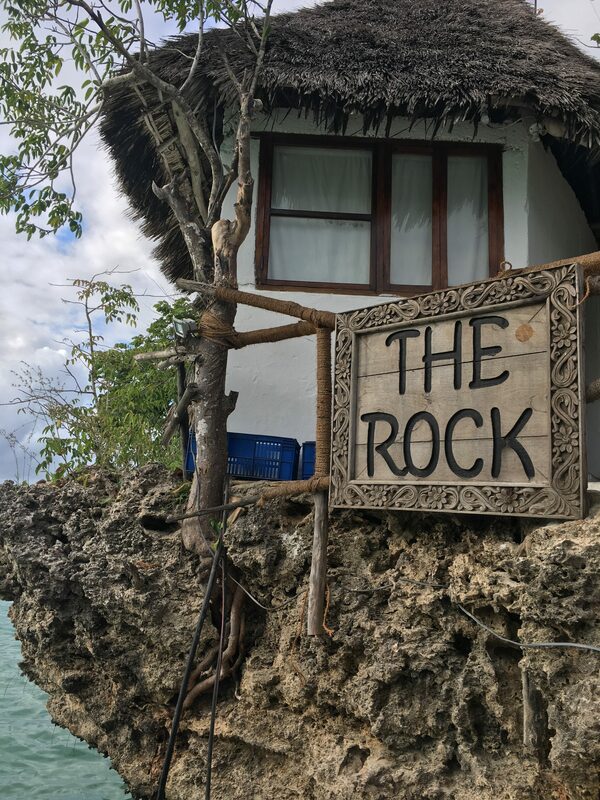 The restaurant sits on top of a Sea-rock in the Indian Ocean, which is a very small ‘Tidal Island’, meaning that it becomes an island during high tides, in low tide you can walk up to it! Personally I think it all adds to the experience with the boat ride and high tide. Hence why The Rock is named as one of the world’s most remote restaurants. It opened in 2010 and was formally a fisherman’s post. Built in typical Zanzibar architectural style, with a palm tree roof and wooden staircase up into the restaurant itself, it all adds to the charm. With only 12 tables inside the restaurant booking is essential for lunch or dinner, to avoid disappointment. There is a beautiful outdoor terrace, where you can sit and sip on your favourite cocktail and absorb the amazing views and scenery right in front of you. On arrival at The Rock, I walked up the stairs and marvelled at the place. Taking a few pictures instantaneously! Definitely understanding how it was on the list of one the places you must see before you die. After a kind welcome, I was offered a seat on the back terrace that you can see from the beach, for a cocktail or two before lunch, it is a spacious area with plenty of seats and tables. It was a busy day and I was offered the menus for drinks and food, they came in frames… such a great and quirky idea. After settling on a Caipirinha to drink, I perused the food menu. I spent awhile on the terrace enjoying the sunshine, views and the general ambience. Is open 12-10 pm 7 Days a week. For lunch or Dinner. ← Zanzibar hints & tips! Ohmygoodness, everything sounds delicious (especially the coconut tiramisu!). Love the idea of a remote dining destination! Lynn it was fabulous!! A must if you are in Zanzibar, as a great experience. This looks so amazing. Haven’t been to Zanzibar yet, but would love to go. The view and the meal, it looks like an experience everyone should have. Wow! What incredible beaches! That food looks absolutely amazing too. What an experience! It was an amazing experience!! The beaches were fabulous.